The Leupold Rib clamps are pretty much the Holy Grail of DW Mounts/Rings. Does anyone know who made this mount? I would love to have this one. 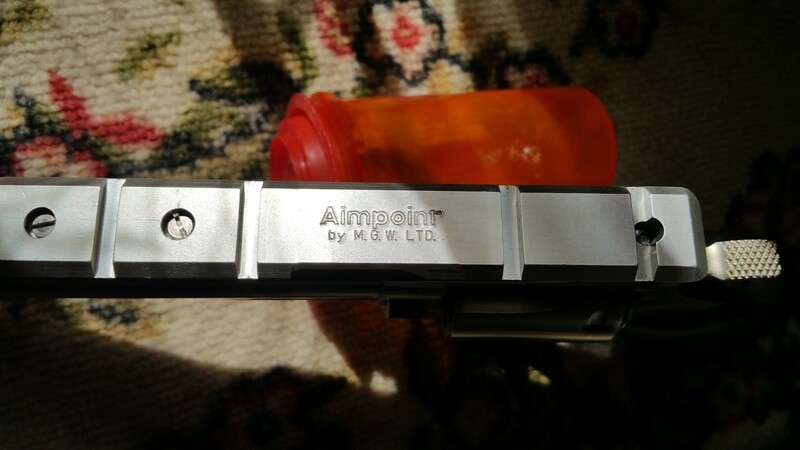 Oh yeah, and the 414 Supermag its mounted on. Thank you for the very nice images. Hey Geddy- I missed that request- Dekker on Specialty Pistols made that as a one off- I’m guessing you figured that out since you are on that forum too. Does anybody know if it’s possible for a gunsmith to modify a standard ribbed barrel shroud to accept b-square rings? Essentially, to add vent ribbing to an un-ribbed shroud? Sam, contact Eric at EWK Arms he may be willing to help you. Or contact Dan Wesson Firearms in Norwich. Are you asking about the bSquare DW clamp on mount? Or a set of rings only? Thanks, Ionwolf, I’ll get in contact with them. And, Steve CT, I’m wondering if it’s safely possible to mill out a standard rib shroud to accept the b-square DW clamps. Thanks for this thread, now I hunt for the parts; I was hoping to not drill and tap a shroud. Just to add to the reference information – the Buehler, Burris and Wiegand drill & tap mounts all use the same screw pattern – so they are interchangeable if you have a shroud already drilled for one, the others will also fit. Just incase you want to change. 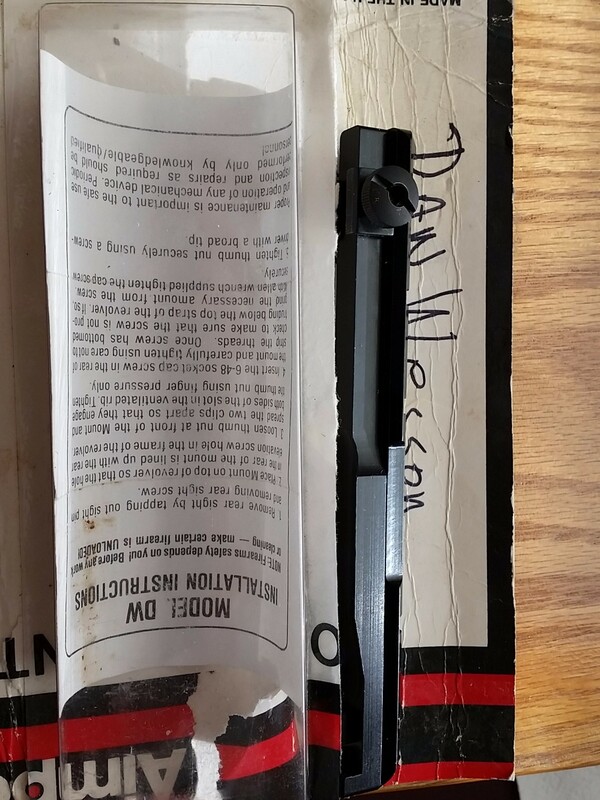 Here is one that came on my DW 357 SuperMag, I was told it is a Tompson Contender insta sight mount. But it works for other mounts as well. Thanks. I have been thinking about a holographic sight. I did finally manage to trade for some scope rings and purchased a nice used 2x Swift scope only to get the scope and the elevation wouldn’t adjust. I just sent the scope in for warranty but they told me they only have silver ones remaining to replace mine – they don’t even offer nice gloss anymore. I thought this might be interesting. 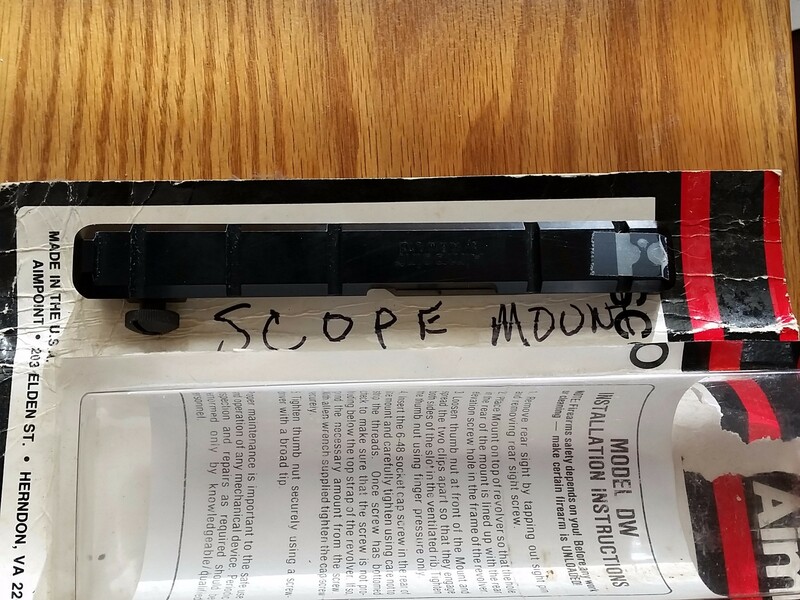 This scope mount came with a “shooter” I picked up a few years ago. I’ve never mounted it.. I don’t have a scope.. but it looks to me that it will work. It’s *different* than the one in this thread. That surprises me. Edit: It appears the other has screws to the rib, and this one just clamps on. Still have to remove the rear sight, though. Update: Weigand no longer produces the scope mount for Dan Wesson revolvers due to “very poor sales”. This leaves the factory D&T mount as the only one currently produced. SCOPE UPDATE FOR 2017. 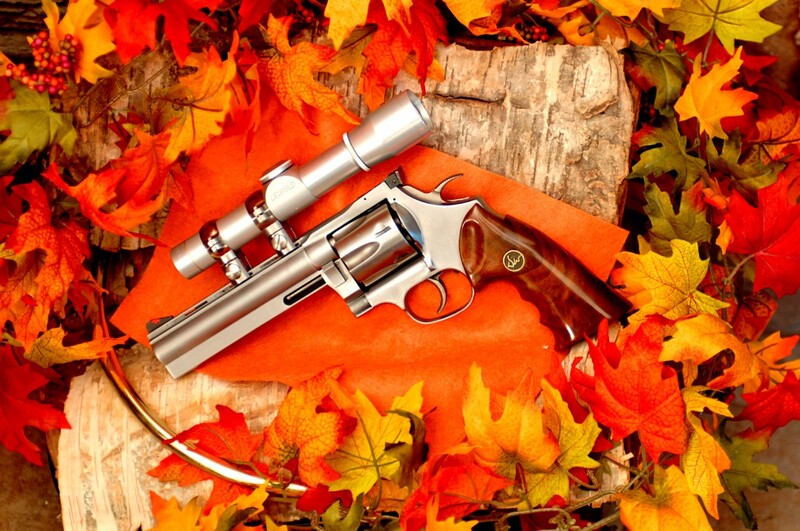 Despite the scarcity of the old scope rings and scope attachment systems specific to Dan Wesson revolvers, there are ways to mount scopes with what is readily available today. 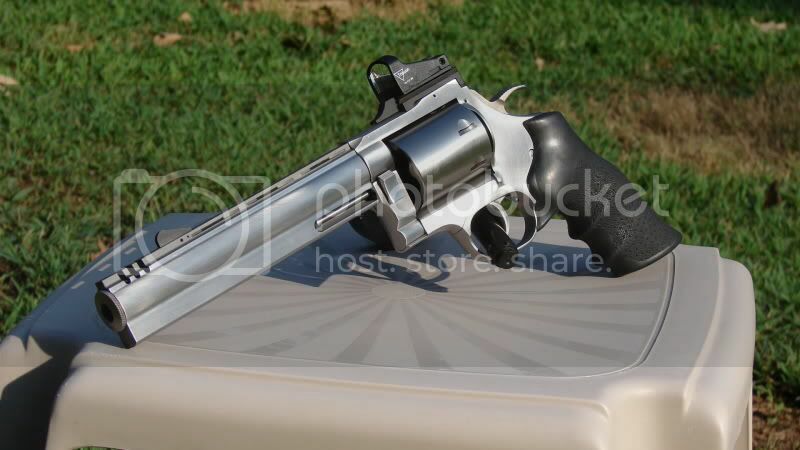 In this example, I used an 8 inch barrel shroud from my 357 magnum. It has a solid rib, so the mounts were tapped into slight indentations cut into the rib. The scope is a Nikon Handgun 2 X 20 Force XR, about $200. The rings and mount are Leopold PRW, with bases, about $100. 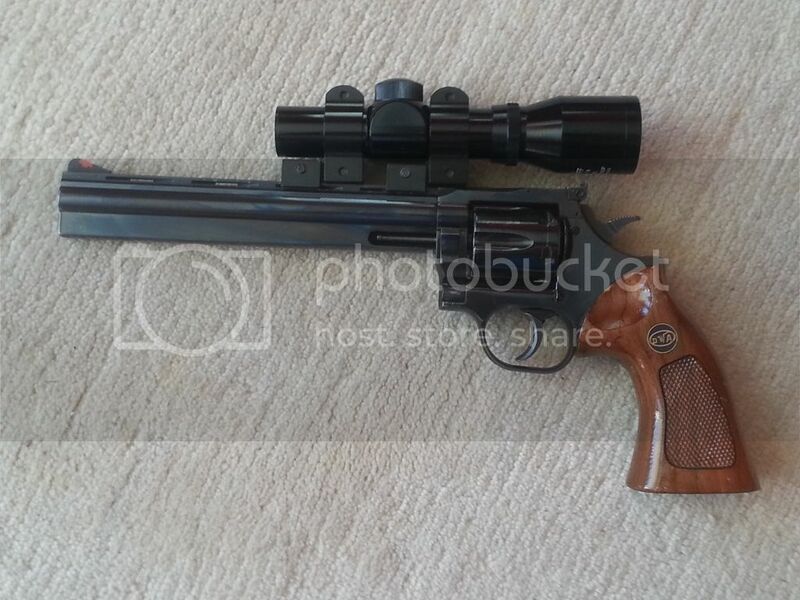 The scope is mounted as close to the barrel as possible, yet everything clears the frame. 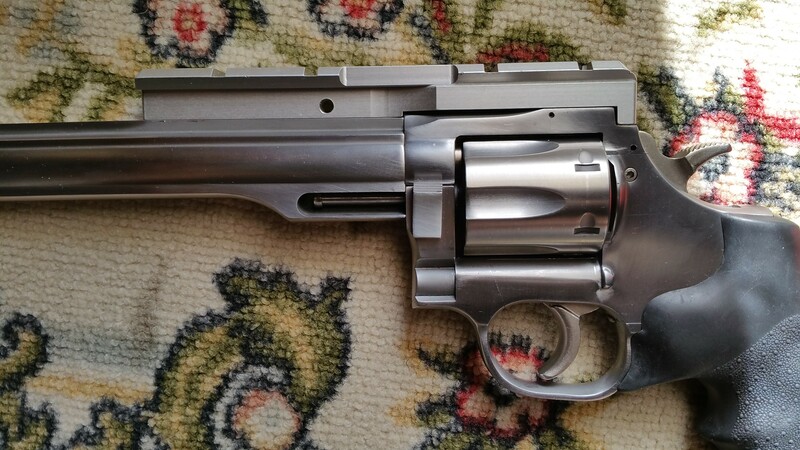 As you know, doing this on a Dan Wesson is much cleaner than just about any other revolver because the gun itself is not compromised and switching barrels leaves the gun the same as it left the factory. With this system, the rear iron sights are left exactly where they are, facilitating the ease of switching barrels. Obviously, you want to use the best gunsmith you can find. I was fortunate to have the services of one of the very best smiths in the state of Texas. I messaged the seller to see if he’s willing to sell the mount and possibly the scope separately. I saw in the original post of this thread that the B-square 2 piece mount isn’t as solid? Anyone have one of these? Any pros/cons? Thanks.